Gordon Brown vowed to soldier on as Britain's prime minister yesterday, admitting that he faced an unprecedented period of turbulence as he awaited another electoral bloodbath. A day after reshuffling his cabinet, a move aimed at reasserting his authority, Brown insisted he had no intention of resigning as he headed to the Normandy battlefields in a brief respite from the battle for his political survival. "I think it's important to recognise that in these unprecedented times, we are bound to have ups and downs in politics," Brown told reporters as he promised to "clean up politics" in the wake of a blistering expenses scandal. "We keep on with the task at hand... We are not diverted," he addded. But despite his defiance, British newspapers said Brown's government had been fatally wounded and called for a general election, while some said it was time for him to step down after heavy defeat in local English elections. Official results from the polls held last Thursday showed the main opposition Conservatives gaining 233 seats and Labour losing 273. Results from European elections are due today, and are expected to yield equally disastrous results for Labour. Brown's cabinet shake-up was brought forward ahead of yesterday's trip to France to be alongside US President Barack Obama and France's Nicolas Sarkozy to mark the 65th anniversary of D-Day. Ten ministers - some embroiled in a row over personal expenses - have resigned in the past week. 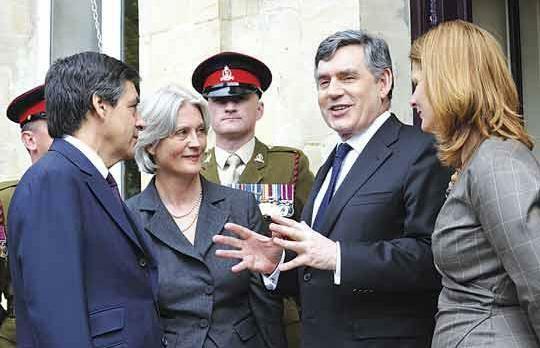 Political analysts believe Labour has little chance of winning the next general election that must be held by June 2010. A victory for the Conservatives, headed by David Cameron, would see the Tories in power for the first time since Labour swept back into power under Tony Blair in 1997. Brown will be hoping his hasty reshuffle does not bring a repeat of Margaret Thatcher's downfall as prime minister, which came as she was holed up at a European summit in Paris in November 1990. Former Labour leader Neil Kinnock said Brown should remain in power. "I'm absolutely certain that Gordon is the best man to take us through the recession, which is by far the most dominant issue facing the country and on people's minds," he told Sky News television. On Friday, Brown handed Kinnock's wife, Glenys, the position of European minister after incumbent Caroline Flint stormed out saying the prime minister had "strained every sinew" of her loyalty. James Purnell quit as work and pensions secretary, saying that under Brown, Labour had no chance of winning the next general election. Defence Secretary John Hutton, Transport Secretary Geoff Hoon and Welsh Secretary Paul Murphy also stepped down Friday.